Designed and spearheaded by the UW Green Futures Lab (GFL), the UW Biodiversity Green Wall, Edible Green Screen, and Water Harvesting System was completed in July 2013. It is located in the SE corner of Gould Hall on 15th Ave and NE 40th St. The project has been a great success, and has the potential to provide numerous benefits such as reducing building energy needs, conserving potable water, increasing urban biodiversity, and improving the experiential qualities of the urban environment. However, in order to both maximize these benefits and replicate them in future projects, they must be monitored, measured, and analyzed. This proposal aims to build off of the intellectual and financial capital already invested in this pioneering project in order to fully maximize its impact. A green wall is any system in which plant material is suspended vertically along the side of a building or freestanding wall. 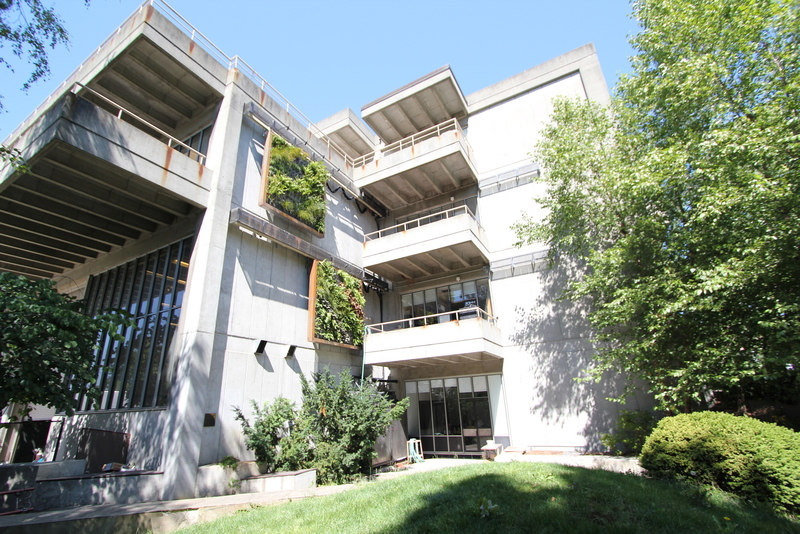 The UW Green Wall was built specifically for demonstration and research purposes, thus it was built as a sliding panel that can be moved to abut a balcony for up close observation and inspection. The wide variety of plants attract diverse insect and bird species. In addition to supporting biodiversity, the green wall captures heat during the day and releases it at night. This helps regulate the temperature of the adjacent building and reduce the urban heat island effect. Rather than rely solely on potable water, a water harvesting system was installed so that the green wall can be irrigated primarily with rainwater captured from the roof of Gould Hall. This has the multiple benefits of diverting rainwater that would otherwise become a source of polluted stormwater and conserving potable water resources. The final component, the Edible Green Screen, consists of a lattice structure adjacent to the building wall supporting vining edible plants. The green screen provides similar thermal benefits to the green wall, and explores the viability of using this type of technology for urban agricultural production. Maximizing the research potential of the Green Wall System was at the core of all design decisions. Funding through Green Seed is necessary to fulfill the research opportunities it was intended to serve. We were awarded a $40,478 Green Seed Grant for 2014 and have currently completed 75% of the research. Our research team encountered some start delays and obstacles to collecting solid data that were out of our control (crows stealing our temperature sensors, a flow sensor breaking, bird camera installation delays, construction on Gould Hall) and we have been granted an extension on our research until Oct 2015 (from the original June 2015). This application is for a small amount of funding to fulfill the extension needs. 7) contribute to UW’s reputation for innovating and espousing sustainable practices. 1) Reducing heating and cooling needs for buildings. By acting as a heat sink during the day and a heat source at night, green walls reduce building energy demands. The EPA estimates the buildings account for 36% of total energy use and 30% of greenhouse gas emissions in the United States. 2) Reducing polluted stormwater runoff. Water harvesting systems divert rainwater from building roofs that would otherwise either go to a water treatment facility or carry pollutants directly into water bodies. 3) Conserving potable water. By relying on rainwater inputs, the water harvesting system significantly reduces the need to irrigate the green wall with potable water. Irrigation currently accounts for the majority of potable water usage in the United States. 4) Enhancing urban biodiversity. The green wall provides important habitat and foraging opportunities for birds and insects. This project was funded during the 2014-2015 academic year.